100 Watt surface transformer mounts to a standard 4" square junction box with round plaster ring (provided by electrician). Rail drops 3.5" from the ceiling. 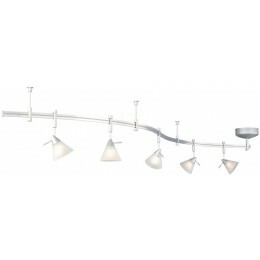 Includes five 3" Sola heads (20 Watts max each) with glass shade. The kit may be dimmed with a standard incandescent dimmer. 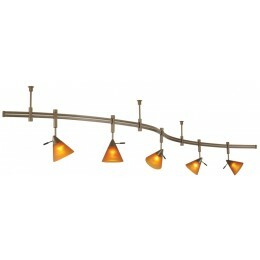 The Tiella 800RAL5AMZ Sola collection Track Lighting in Bronze uses Halogen light output and brings Modern style. This item is 6"H x 108"W. The total wattage is 100 and the voltage is 12 volts. 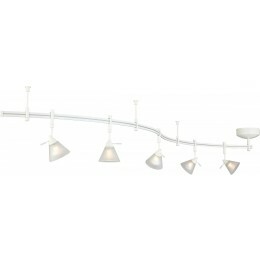 The Tiella 800RAL5AMZ requires 5 bulbs (included). Additional Information: Shade-Amber Glass.